Add sugar to water, add ginger, star anise, lime juice and zest to create syrup for poaching and bring to the boil. Add persimmons slices to syrup, bring back to boil, turn of the heat and set aside to cool. Once cold place into the refrigerator. Place a saucepan half filled with water onto medium heat and place a heat resistant glass bowl on top of the saucepan. Add chocolate to the bowl and slowly melt. Separate the egg whites and yolks in separate bowls. Add sugar and vanilla essence to the egg yolks and whisk until pale in colour. In a separate bowl whip the cream. Whisk the egg whites, when almost stiff add salt. Remove the chocolate bowl from the saucepan and gradually add the egg yolk mixture, making it fairly firm. Gradually fold in the cream and then gently fold in the egg white. Place mixture into the refrigerator and chill for at least 2 hours or until mousse is firm. 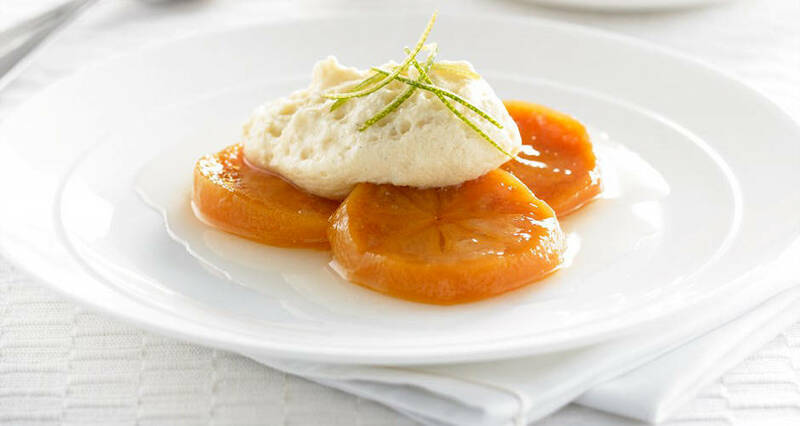 Place persimmons onto a plate, top with a generous dollop of white chocolate mousse and garnish with lime zest.